In an interview published by the Washington Post Sunday, President Hamid Karzai called for reducing the number of US troops deployed in Afghanistan and calling a halt to aggressive operations that are claiming a growing number of civilian lives. The statements by the Afghan president coincided with a sharp spike in violence, with five NATO troops killed on Sunday and a series of attacks staged by armed anti-occupation forces across the country over the weekend. Karzai’s remarks underscored the increasingly fractious relationship between the Obama administration and the Afghan president, who was installed as Washington’s stooge by the US intervention that began more than nine years ago. The call for cutting back on combat operations and reducing the US military’s footprint in Afghanistan comes just as the Pentagon is launching its major offensive in Kandahar province, a stronghold of the Taliban, and only months after the arrival of the last of the 30,000 additional troops ordered into the country under the surge announced by President Barack Obama last December. He continued that it was “not desirable for the Afghan people either to have 100,000 or more foreign troops going around the country endlessly” and declared the US deployment unsustainable and an “unnecessary burden” on US taxpayers. Karzai said that the Afghan people wanted their “countryside, villages, homes, towns, not to be so overwhelmed with the military presence,” suggesting that US troops should be confined to their bases and employed only in combating cross-border incursions from Pakistan. In particular, he denounced the escalating number of night raids carried out by US special operations troops seeking to kill or capture members of the Taliban and others suspected of fighting against the occupation. He likewise condemned “the violence and the violation of our laws” by private security contractors, which, together with civilian contractors, he charged, have contributed to the creation of a “parallel government” in Afghanistan. Karzai also hit back at Washington’s criticism of corruption within his regime, blaming US contracts and funding pouring into the country that is out of his government’s control and, which he said, is often funneled to children and relatives of leading Afghan officials. Karzai’s statements came in advance of a NATO summit to be held in Lisbon at the end of this week to consider strategy in Afghanistan. They cut directly across a concerted campaign being waged by US officials to disabuse the public of any illusions that the Obama administration intends to carry through with the pledge made by the US president last December to begin withdrawing American troops from the country in July of next year. Instead, US, European and Canadian officials are all now speaking in terms of a “transition” of the US-led occupation force’s control of the country to NATO-trained Afghan security forces at the end of 2014, with troop levels to remain high and combat operations continuing until then and beyond. The Post also reported an “ ‘enduring partnership’ agreement being negotiated between NATO and Afghanistan [that] will extend security support indefinitely.” The pact, the paper said, will be completed by January. Gen. David Petraeus, the senior US commander in Afghanistan, is expected to report to the Lisbon summit that the 30,000-troop surge has already begun to effect a major shift in Afghanistan, with the occupation gaining the momentum against the Taliban and other resistance forces. The US general has based himself on a body count developed by the Pentagon for alleged leaders and supporters of the insurgency killed in the special operations raids that Karzai is demanding be brought to a halt. According to figures provided by the Pentagon to CNN late last month, special operations forces had killed 339 “insurgent leaders” and 983 “rank-and-file insurgents,” while capturing nearly 2,500 more alleged fighters during more than 3,400 operations carried out over a 90-day period ending October 21. 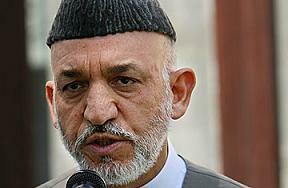 As Karzai’s statements suggest, these operations have been accompanied by the deaths of large numbers of civilians. US and NATO officials expressed displeasure with Karzai’s remarks, while indicating that the Pentagon’s military strategy in Afghanistan will not be swayed by the opinions of a president that Washington treats as a puppet. Republican Senator Lindsey Graham, a member of the Senate Armed Services Committee who was part of a congressional delegation that met with Karzai last week, described himself as “just stunned” by the Afghan president’s remarks. The US offensive in Afghanistan has been marked by a surge of violent clashes. Occupation officials reported that five NATO troops died on Sunday, the worst death toll in over a month. Three of them were killed in clashes with resistance fighters in the eastern part of the country, while two more died in explosions in the south. Three NATO soldiers were reported killed on Saturday. The year 2010 is already by far the deadliest for the occupation since the US invaded Afghanistan more than nine years ago. A total of 639 US and other occupation troops have been killed thus far this year, compared to 521 for all of 2009. NATO officials acknowledged that US troops fighting in the Zhari district of Kandahar province Sunday unleashed an artillery barrage that killed one child and left another seriously wounded.